I have been thinking about brunch a lot lately. Here in London nobody ever meets up for breakfast. (Unless it is a work meeting and you get paid to do it). I love brunches because they are like a breakfast (my favorite meal of the day) which does not seem to end. 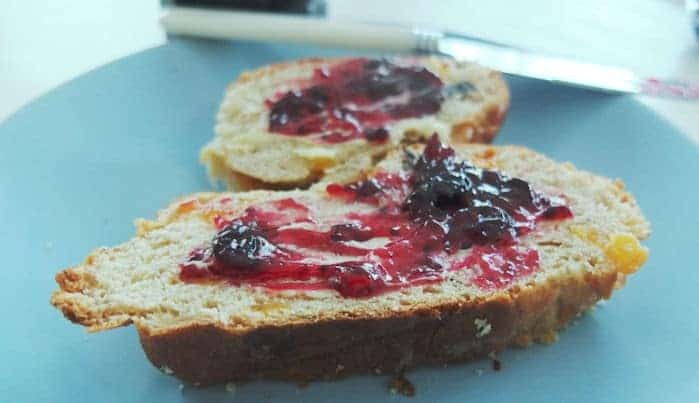 Today I want to share with you one of my favourite brunch and breakfast breads. This Sweet German Yeast Bread with Dried Fruits is the perfect treat for lazy weekends. It’s sweet, but not too sweet and so is the perfect accompaniment to any jam. It also tastes great with butter, nutella or by itself. Kept in an airtight plastic bag or container it keeps for up to a week, so you can have it every morning! 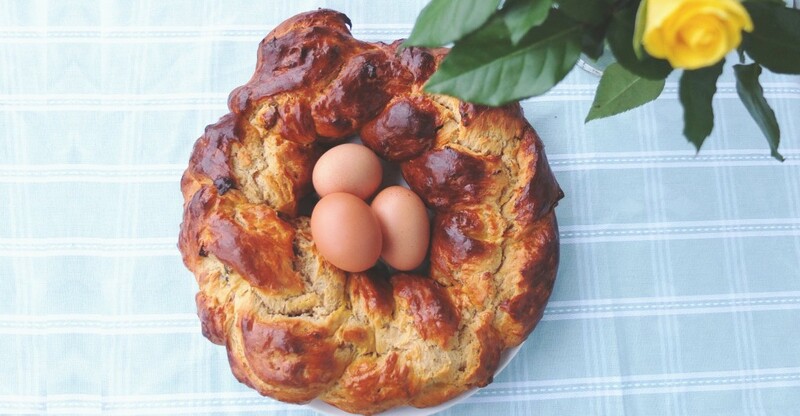 I made this one for some German Easter baking, as brunch on Easter Sunday is traditionally a feast in its own right. Hence the eggs in the middle. I would have coloured them if I could find white eggs anywhere in the UK. I will not give up …. but that’s another story or post. Chop the fruit into small pieces. Melt the butter in a pan and in another dish heat up the milk until it is lukewarm. Add the yeast to the warm milk and let it dissolve. In another bowl mix the flour, salt and sugar together. Add the melted butter, 2 eggs, dried fruit and the milk/yeast mixture. Knead to an even dough. Cover and leave to rest for about 45 minutes. Divide the dough into three strings around 60 cm long. Make sure your hands are covered in flour and weave the dough into a braid. Form into a wreath when placing the bread on the baking paper. Mix the egg yolk and cream and spread it with a pastry brush evenly over the bread. Place into the oven and back for about 40-60 minutes.